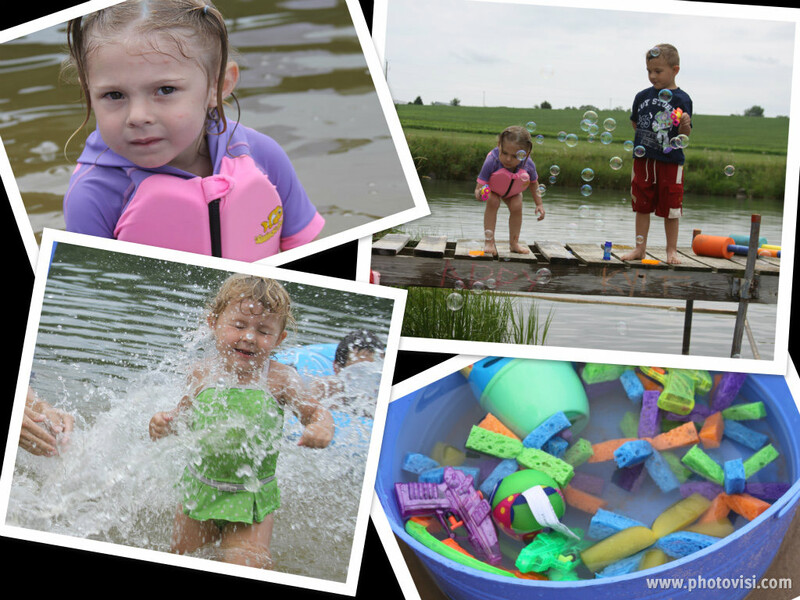 Want to take your kids on an exciting camping trip that they will never forget? 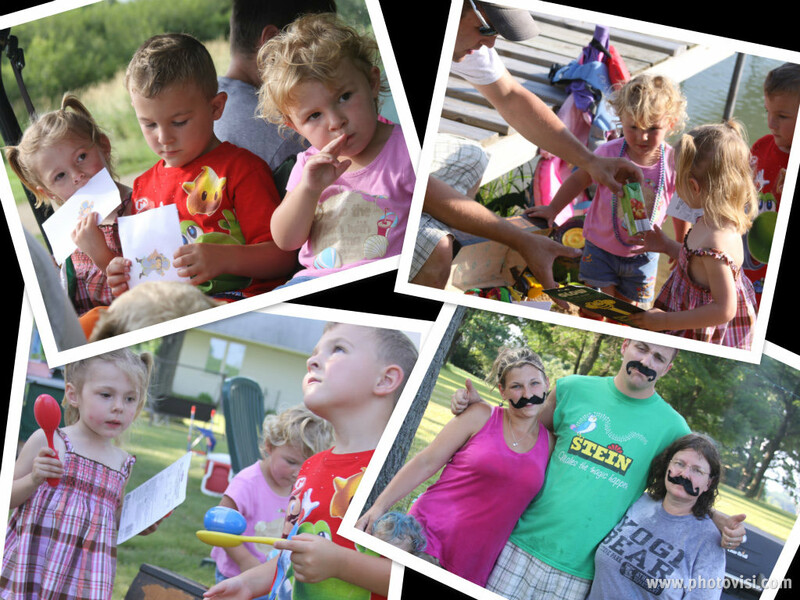 Camp with your kids in your very own backyard! Add a batch of kid friendly activities and fun food, and it will be a most memorable adventure that they will enjoy and so will you! Our family usually plans a whole family camping trip each summer. It seems as though our individual little families get so unbelievably busy throughout the year, that it is a great way for us to get away and spend some time together as a family unit. We have 4 small kids in the family that were all 4 years and under last summer. Camping with kids that small can be stressful instead of relaxing if you don’t plan ahead. 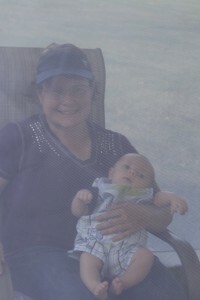 On this particular camping trip we had just welcomed my brand new nephew into the world. Not only were we camping with 2 toddlers, and a preschooler, but a newborn as well. That means a lot of “necessitates” and extra stuff to pack for all of the “what ifs”. Because of the new baby (who is the sweetest and most adorable baby on earth I might add) we decided that instead of heading to a campground, we would opt to camp in our backyard. We had ventured with the three other kids to A Jellystone Park the year before and had a blast. The campground was really geared toward kids. It had a lot of activities that were fun for them like movie night, kids pools, hayrides, and mascots to meet. Although we had a great time there, we decided that the brand new baby may need the amenities of home at some point, and that we would all enjoy ourselves more if we stayed home and camped in the yard. I felt a little nervous about the kids having a good time, and pictured us all sitting around a campfire all day and them getting into trouble so I devised a plan for a jam packed weekend of fun. Not to mention this was our little families only “trip” of the summer and I really wanted it to be fun. 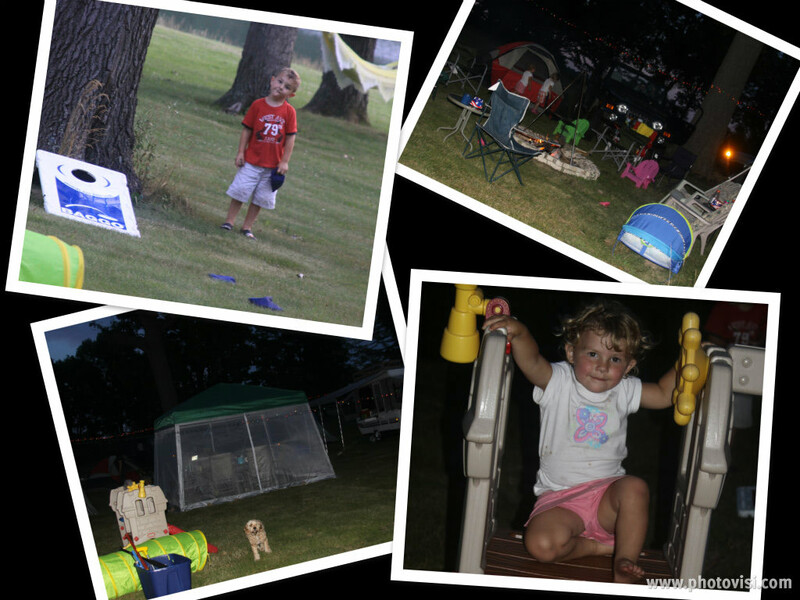 So we planned a weekend, and instead of spending money on a campsite, we spent that extra money to make our backyard camp out as fun as we could for the kids and the adults too. I tried not to tell the kids or the adults what I had planned for fun activities for the weekend except for my sister in law who helped me pick up some of the goodies. 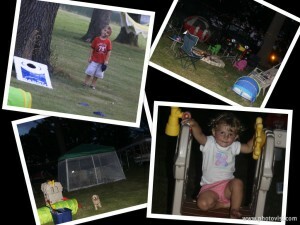 I was hoping the surprises would turn our backyard camp-out into a family vacation to remember. When it came to feeding the bunch we spread out the responsibility between each family. Each family picked one day, and was in charge of all of the food for that day. This worked out great and we had lots of fun snacks and treats for the entire family. This kept cooking simple, and gave each family two days to not worry about food while the other family cooked for the day. These twelve activities along with rides on Grandpa’s John Deere Gator kept us busy the entire weekend, and didn’t give the kids a moment to get bored. The things we did were a mix of energy packed activities that were exciting and hilarious as well as some relaxing and quiet activities for nighttime. I know some of the items seem like a strange addition to the “treasure”, but there was a purpose for each and every item as the weekend wore on. Next came the real fun!! 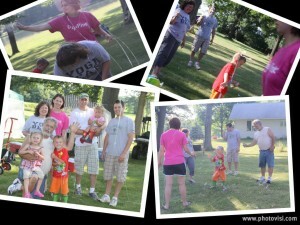 As the treasure box began to empty the adults noticed the silly string first. 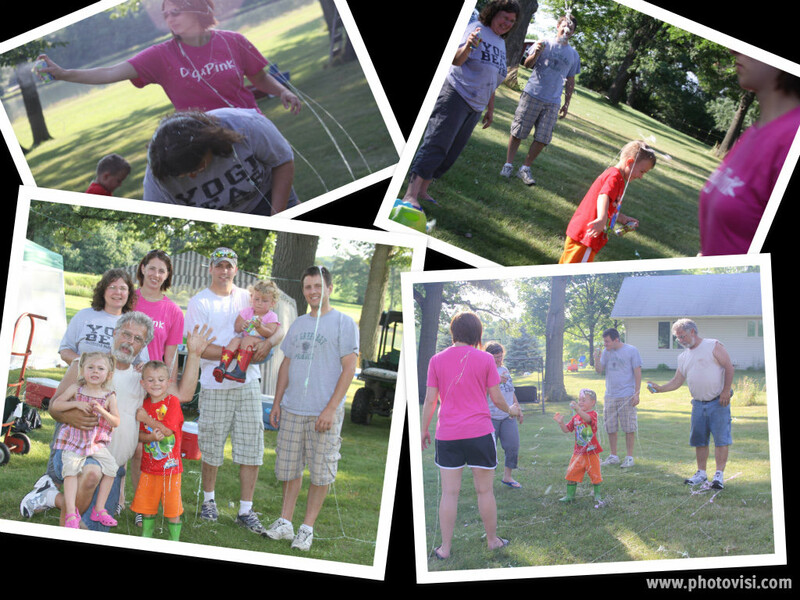 Each adult, and child was armed with a can and the silly string war began. 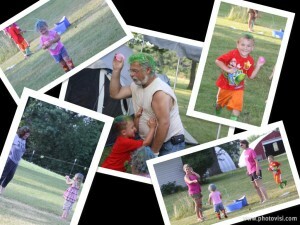 Grandpa seemed to be the number one target for the kids, and they were not shy about it! 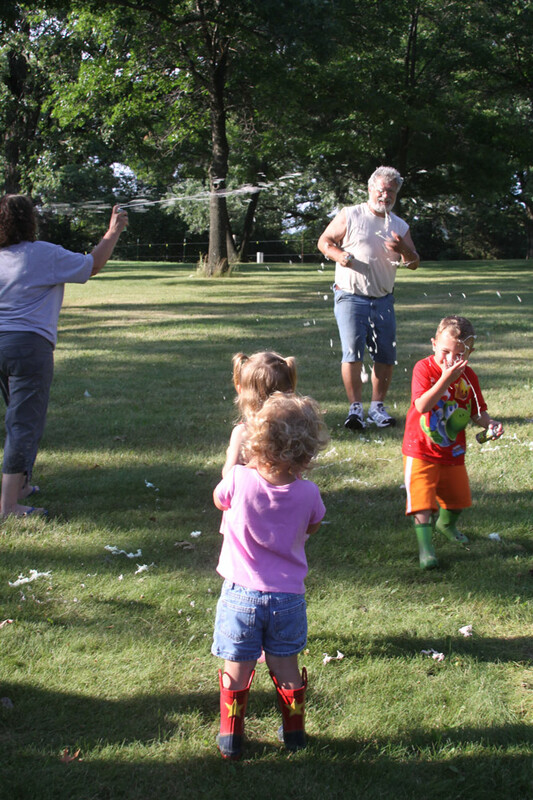 We chased each other all over the yard grinning from ear to ear until our cans of silly string were gone! It was a total blast and I wish I had gotten more, because the fun ended too soon. You can buy silly string at a great price from the dollar store. The family photo that I took after our silly string fight is one of my favorite family pictures of our not so serious family! It was a great time and filled us with a great memories for sure! Our next activity included a package of toilet paper and was a super cheap way to have a whole lot of fun while we were camping. We gave each person in the family a roll or two, and we got busy T-Ping the entire campsite. It was a really fun activity, and I think the adults all had flashbacks to their high school years as they tossed rolls of paper up into the trees. It was much more fun in broad daylight, without the thought of being caught, than I remember from my teenage years! The kids enjoyed covering Grandpa’s Jeep and his John Deere Gator, and it was the perfect height for them to really cover it well. 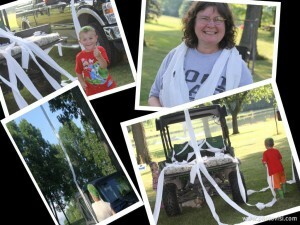 The toilet paper was a fun way to “decorate” the campsite for the kids and made for easy cleanup later that day. We gathered it all up and tossed it into the fire that evening. The next free-for-all involved 8 cans of colored hairspray. 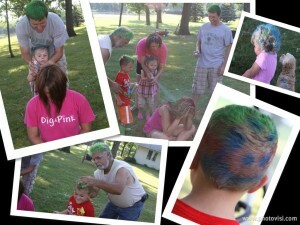 This stuff was SO fun and we had a lot of laughs as we sprayed each other’s heads of hair in bright colors. My favorite paint job was my son’s. Grandpa painted a happy face on the back of his head, and I couldn’t help but laugh every time he walked away from me. The kids could not get enough of turning the adults hair fun colors, and we all got a kick out of spending the rest of the afternoon with crazy colored hair! 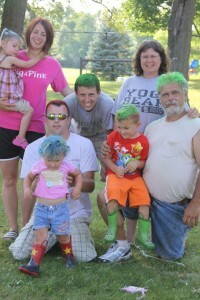 It’s hard to be serious when you are trying to have a conversation with someone sporting neon green hair. Quite a sight: From Grandma and Grandpa to the family dog where all decorated in fabulous camping style and colored hairspray. I found the spray at Party City and got one in each bright color that they had. The spray rinses right out with water, so it was the perfect festivity to do before our water fight so that we could wash away our fancy colored hair before hitting the sheets at night! The water balloon fight was a blast as well. The guys started cooking some steak on the campfire and I started filling a bucket with filled water balloons. As soon as the kids noticed me filling them, they instantly disappeared faster than I could fill them. The men cooking at the campsite became their target, and the game was on. Funny how kids that age love to throw balloons at people, but cry when they get hit with one! We kind of let the kids run the show on this one to keep it fun! There were a few adult launched balloons in the end, but we all were drenched when the balloons were gone. At that point most of the colored hairspray had been washed away, but we decided to take a swim after dinner to wash the rest off. We are so lucky to have a pond that we can swim in but this could be as easy as getting out the sprinkler or the kiddie pool. Just make sure you get the adults involved too. What joy it would be for the kids to see their parents and grandparents racing through a sprinkler! We got out the bubble guns that each kid got in the treasure box from the scavenger hunt. I wrote each child’s name on the pier with sidewalk chalk and laid their bubble kits out by their names. That gave them each a space on the pier without pushing each other around and falling off the pier. They each enjoyed that they had their own space, and they happily blew bubbles over the pond while the adults swam. It gave us a great opportunity to relax a little and still occupy the kids attention. I also made a batch of sponge balls that I put by the pier for people to launch back and forth to each other. These are a simple and cheap summertime DIY must! They are so much fun because they get totally saturated with water and when they hit someone they are soft, but really really wet! They are really fun, and I can’t wait to share with you how I made them. Between a relaxing swim with the kids, water fight, sponge ball fight, and squirt gun fight we were all free of our colored hairspray. After all of the activities of the day we were all exhausted, but what a fun filled day together! We hung out around the campfire and made some s’mores before heading of to bed. 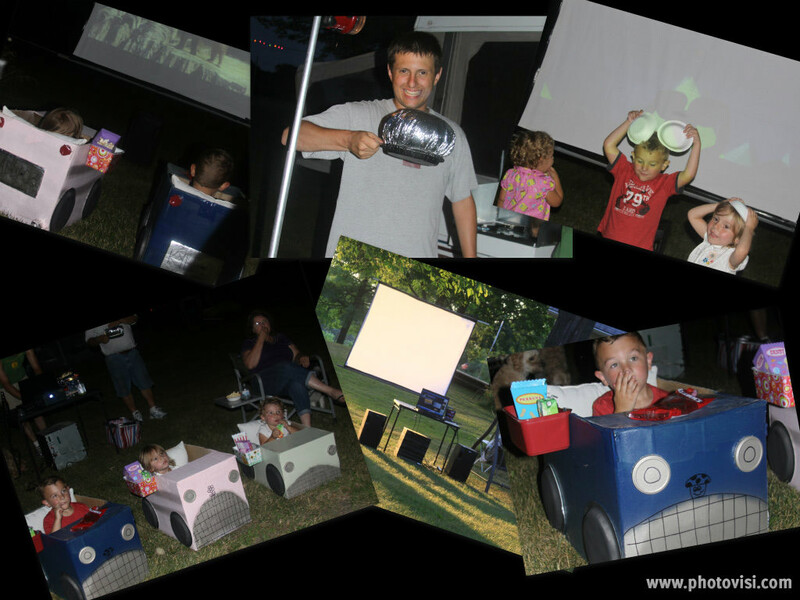 Another nighttime activity that I had planned was an outdoor movie night complete with drive in movie cars for the kids. I made a DIY movie screen that I attached between two trees in the yard. I borrowed a movie projector from a friend and we were able to watch the Yogi Bear Movie outside under the stars. The kids each got a glow stick (from the dollar store) out of the treasure box to keep them entertained during the movie. I made little cars out of cardboard boxes for each of the kids that they could sit in and watch the movie comfortably. They each had their own little snack tray attached to their car with their favorite candy (from the treasure), popcorn in their new container (also from the treasure), and a drink. The inside of the car had comfy cushions for them to sit on. We made Jiffy Pop before the movie began and that process alone was fun for all. The adults got their choice of their favorite candy and their own Jiffy Pop popcorn as well. The kids adored their drive in cars, and it really helped the adults from having to get up a hundred times during the movie to get them snacks and drinks. Our 2, 3, and 4 year old kids sat perfectly contend in their cars and watched the entire movie! I have to say this was one of my favorite parts of the weekend, and I can’t wait to have an outdoor movie night again. I still have the screen, and the kids still use the cars too. We sometimes use them in the house on movie night just for fun! We also had lots of kid friendly games, and toys available to keep the kids busy throughout the weekend. The wiffle balls from the treasure were so the kids could play baseball and hit them off of a tee. We played kickball, and baseball as a family. The kids enjoyed playing Bag-go with the adults. We lined the entire campsite with Christmas lights for the kids too. It made it really fun at night, and was also very helpful to have a soft glowing light if we needed to get up with them. It made them feel comfortable to have a little light and added to the fun too. We also made sure to have a place for the kids (especially the baby) to get out of the sun and the bugs. We had a screened canopy tent that allowed us a place to let the kids eat without the threat of bug bites or sunburn. We had plenty of drinks to keep everyone hydrated, bug repellent, citronella candles, and lots of sunblock on hand to try and keep everyone as comfortable as possible. Planning ahead and having those things really made the weekend easier with the kids. All in all our entire family had a blast! The weather did not cooperate, but it didn’t seem to matter. We packed our fun activities in between the raindrops and made memories that will last a lifetime. It was great to see the kids having so much fun doing all of the crazy activities, but even more fun to see the adults act like kids while they did them! It was great to spend time all together as a family and the new baby got to enjoy the show too! We were thankful that we were home, because a couple small thunderstorms sent us inside with the kids. I can’t imagine what it would have been like at a campground if we couldn’t get inside during the storms that we had. Down pours that made the insides of our tens soaked put a damper on the sleeping situation but not the fun. All four kids did great throughout the weekend and I hope it is something that they will never forget. I know I sure won’t, and I love looking through the pictures of our fun family camping weekend. You don’t always have to spend a lot of money, or go far away to have a memorable family vacation! Stay home, camp in the backyard, plan some fun activities, and enjoy the company and some laughs! IOU family is planning on a camping trip the end of July….I want to make this year a memoriable one…..loved your activities!! I would like to do an outside movie…..what kind of projector did you use or tis?